​Being a cat owner can be a big responsibility at times, but it should be a lot of fun as well. Not only does your cat become your friend and companion, but he or she will inevitably become a fantastic source of entertainment. Nothing is quite as amusing as watching your cat chase the dot of a laser pointer around the house or seeing them play with with their cat tree. There are plenty more cat-friendly products that can help you and your cat have more fun together throughout the year. When you become a cat owner you have to stock up on some necessary supplies like cat food and treats, toys, and scratching posts. But if you take the time to look around online, you will find that there are an unlimited array of other cat-friendly products that both you and your cat are sure to get a kick out of. Here are our top ten. Depending where you live, you may or may not feel comfortable letting your cat go outside on his own. If you are worried about your cat getting into trouble outdoors, this ABO Gear Happy Habitat may be the solution you and your cat have been looking for. 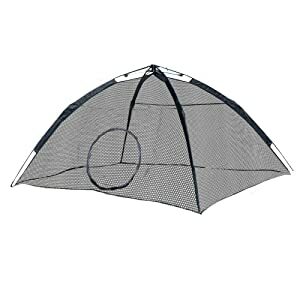 This product consists of a sheer mesh tent that you can set up in the backyard for your cat to play in. ​The tent provides more than 30 square feet of space for your cat, keeping him safely contained while also giving them room to play. The tent is incredibly easy to set up and as it is sheer, you can keep an eye on your cat from anywhere in the yard – it even folds down into a carry bag so you can take it with you on trips! This ABO Gear Happy Habitat is great for cats that want to be outside but it still gives you peace of mind in knowing that your cat is safe. If you are tired of your cat’s smelly litter box making an unsightly mess in your home, the Good Pet Stuff Plant Hidden Litter Box might just be the solution you’ve been looking for. 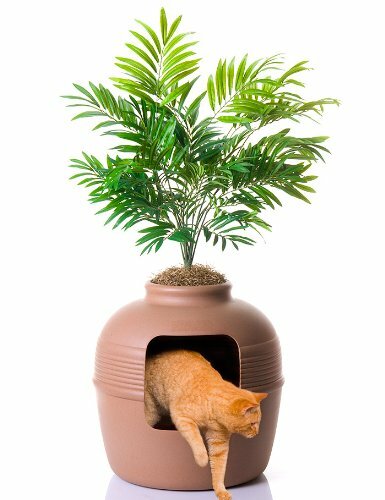 This product is shaped like a large clay planter but it has a built-in large-capacity litter box where your cat can do his business. This litter box enables you to keep your litter box out in the open where it is easy for your cat to access without having to worry about it interfering with your home décor. The litter box features a filtered vented system which keeps the litter box fresh for your cat and your home smelling clean for you. This litter box is particularly designed for larger cats and for multi-cat households. Do you have a cat who scarfs down his dinner as soon as it hits the floor? Are you looking for a simple way to manage your cat’s portions but you don’t always have time to keep to a regular feeding schedule? The Home Intuition Portion Control 6-Meal Automatic Feeder might be just what you need. This automatic feeder features six individual compartments that you can fill with your cat’s food. You then set the programmable automatic timer to your cat’s preferred feeding time and then set it down wherever you like to serve your cat’s meals. The top of the round feeder rotates to open one compartment at a time for your cat to eat from, keeping the other portions covered. 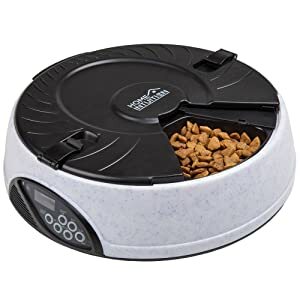 This automatic feeder is great for cats who need a little help managing their weight and it is also convenient and easy to use for you! Many cats will spend hours looking out the window, watching birds, squirrels, and other animals run around the yard. Cats also love to take naps in the warm afternoon sun. If you want your cat to have access to both of these options but your window is not situated properly, a window-mounted cat bed could be the ideal solution. 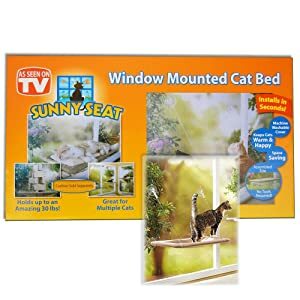 This cat bed from Sunny Seat can be mounted directly to the window using a suction cup system which provides support for your cat’s weight without damaging your wall or window. The cat bed is perfectly sized for two cats to sit or lie side by side, or for one cat to stretch out in the sun. Give your cat a front seat view of the outdoor world while keeping him safely inside with this comfy Sunny Seat window-mounted cat bed. Does your cat love to go outside but you don’t want to cut into your door to create a cat door? 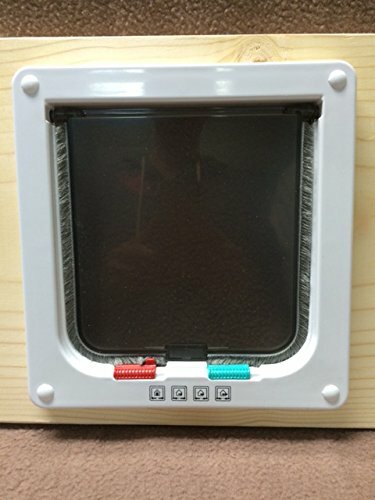 This custom-built cat door window insert from Cat Flap Fever might be just what you’ve been looking for. By installing this window insert you can give your cat unlimited access to the outdoors through one of your windows instead of ruining your front or back door. This window insert is perfect for the devoted cat owner who has built a catio (an outdoor cat patio) for his cat or to provide access to a screened-in porch. This cat door is perfectly sized for your cat and very easy to use, but it also gives you the option to control access by locking the door so your cat can’t use it when you want to keep him inside. Best of all, this cat door window insert is custom built to fit your window perfectly. Cats love to chase moving objects but you can’t spend your whole day rolling balls or dangling your cat’s favorite toy on a string. 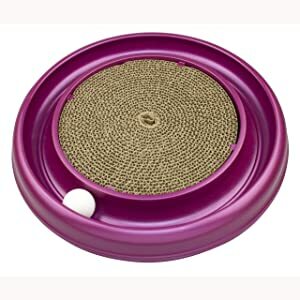 The Bergan Turbo Scratcher cat toy combines your cat’s love for moving toys with his need to scratch all in one affordable toy. This cat toy features a round track with a contained ball that your cat can bat around all by himself. The ball stays on the track, racing around in a circle and making a noise that is sure to drive your cat wild. The center of the toy is filled with a round cardboard scratcher that you can sprinkle with dried catnip to encourage your cat to sharpen his nails on it instead of on your living room furniture. This cat toy is a great way to keep your cat occupied when you don’t have time to play and it is something he will never get tired of. Many cat owners find that when they spend money on expensive cat beds, their cats ignore them, choosing to sleep in cardboard boxes instead. The Favorite Soft Portable Opening Cat Play Cube Bed is the perfect solution for this problem because it combines your cat’s need for a comfy bed with his desire to be safe and hidden away in a box. 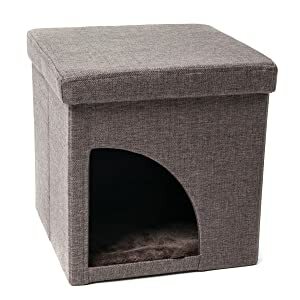 This cat cube is perfectly sized for a large cat and it can be placed anywhere in your home. It features a lightweight but durable construction that is easy for you to move and carry but sturdy enough for your cat to climb on. Your cat will love sleeping in this cave-like enclosed cat bed and you will love that he actually uses the things you buy him. Once again you will be able to use your cardboard boxes for their intended purpose because your cat will be happy in his Favorite Soft Portable Opening Cat Play Cube Bed! Cats love to jump and climb but you don’t like it when they do it on your furniture. This Go Pet Club Cat Tree is just what your cat needs to redirect his attention away from your couch into a more appropriate outlet. Made with multiple levels and plenty of comfy places to lounge, this cat tree is sure to keep your cat occupied for hours on end. This cat tree measures 62 inches high and your cat can perch all the way up at the top, looking down on his domain from a safe distance. It also features a hammock, a cat bed, and an enclosed space for your cat to sleep so he has many options to choose from. 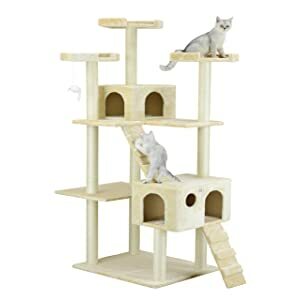 You will love this cat tree because it comes with rope-wrapped supports that double as scratching posts and it is easy to clean with the nozzle attachment of your vacuum cleaner. Does your cat love to burrow? 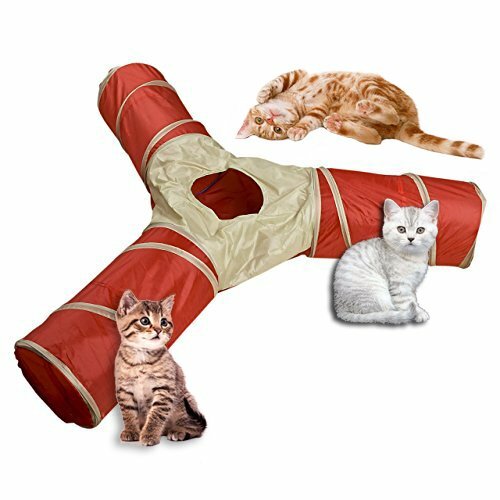 If so, he will love this Newcomdigi 3-Way Cat Tunnel. This cat tunnel features three different tunnels that meet in the middle with a peephole that your cat can peek through or use to access the tunnel. Use this cat tunnel to play a game of hide and seek for your cat or sprinkle some dried catnip into the tubes to keep him occupied all by himself. You will love this cat tunnel because it will provide your cat with endless hours of amusement and it will keep him from burrowing in your blankets or clean clothes! The tunnel collapses down in just seconds for easy travel and storage and it pops open just as easily when your cat is ready to play. When you become a cat owner you have to resign yourself to understand that everything you own will eventually be covered in cat hair. Not only do cats shed on a daily basis, but they have a tendency to rub themselves on clean clothes and other things just to make sure they get covered in hair. 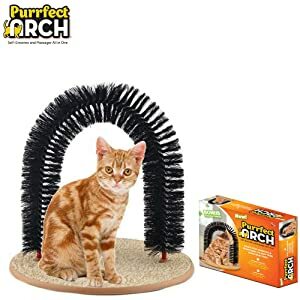 The Purrfect Arch Groom Toy is a solution that will meet your cat’s needs as well as your own. This toy consists of an arch covered in soft bristles that your cat can rub himself on for a soothing massage. As your cat rubs on the toy, the bristles will help to collect some of his hair so it doesn’t end up ground into the carpet or deposited on your furniture! This toy enables your cat to groom himself while also cutting down on the number of times you need to vacuum your house.